I've been a busy bee as of late and my hard work is now starting to roll out on newsstands! Right now you'll find me in the February issues of Latina (asking experts all about weight loss plateaus, low libidos, stress, multivitamins and hand sanitizers) and [drum roll please] Travel + Leisure. That's right, my first contributions at work are finally published (check out my write-ups on romantic hotels in Jamaica, Spain and Morocco). And that's just the beginning as I've also been working on several stories for their upcoming family insert, pieces for a future iPad issue as well writing for Latina.com again. All good stuff, huh? Even A. tried to steal a bit of my magazine thunder by landing a quote in Glamour's February issue. Can you blame him though? After you get through the hard part (you know, actually researching and writing those damn stories), seeing your finished piece on the glossy pages of a magazine never gets old. Can I have your autograph please? Did part of your research include checking these places out in person???? CONGRATULATIONS! Good job Dorkys! I will be sure to check out your articles next time I am at a magazine stand! Congrats Dorkys! The best part is having access to free magazines! lol Right now I'm on Bridal Guide Magazine's March/April issue- spotlighting Designer Hotels and a little insert on how to be 'Legally Wedded' in Mexico! Coolness! PS- You're so dang busy how do you even blog more than a sentence? You certainly have developed a marvelous writting career! I read Latina faithfully - looking for your spots! 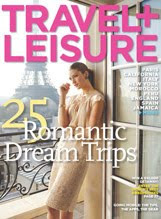 I'd read travel and leisure too - cept I'd be soooo aggravated since I can't go to all these great places! Grazie, everyone. And Tracita, I'm barely managing these days! When I do get ideas for posts, I'm too zapped and frazzled to sit and write them. This is why they've been fairly short as of late.